No pilgrim to Compostela can be unaware of the existence of a document which, since the Middle Ages, is supposed to have been the route companion of his predecessors, the Pilgrim's Guide. It is the last Book of the XIIth-century manuscript known under the name of Codex Calixtinus, preserved in the cathedral of Compostela. The Codex Calixtinus was published in full for the first time in French by Bernard Gicquel in June 2003 *** . Until now, only the last Book was accessible to francophone readers through the 1938 translation of Jeanne Vielliard under the title Pilgrim's Guide. It was edited for the first time in Latin in 1882 by Father FITA. Since this edition, it has fed speculations regarding the pilgrimage to Compostela. The title Pilgrim's Guide popularised by its translation into French in 1938 gave it a new life and a considerable audience, confirming its key place in compostellan research. Often confused with the Codex as a whole, the Pilgrim's Guide represents only about the 10th part. It became such a commercial success that it is constantly being reedited such that today's pilgrims have ended up believing that they have in their hands a copy corresponding to the guide of their pilgrim predecessors, ancestor of the topo-guides of the FFRP (Fédération Française de la Randonnée Pédestre). "1- Saint-Gilles, Montpellier, Toulouse, le Somport. 2- Notre-Dame du Puy, Sainte-Foy de Conques, Saint-Pierre de Moissac. 3- Sainte-Marie-Madeleine de Vézelay, Saint-Léonard en Limousin, Périgueux. 4- Saint-Martin de Tours, Saint-Hilaire de Poitiers, Saint-Jean d’Angély, Saint-Eutrope de Saintes, Bordeaux. These last three routes come together at Ostabat and, via le port de Cize, join in their turn the first at Puente-La-Reina in Spain." « as regards the routes of Saint James it would perhaps be idle to seek to trace further the network in the future … it would be without much interest for one would only be redrawing the network of communications of the Middle Ages ». Thanks to the Guide, the idea became widespread "that there were four routes to go to Compostela". This reduction in the number of routes in France found a certain justification in the fact that in Spain, the guide only mentioned the road in the interior, via Burgos and Leon, imposed by geography. - Abbé Daux, in 1900, reworked Nicolaï's map by extending the route from Tours as far as Paris. In the region he knew best, south of the Garonne, he multiplied the routes which he declared principal or secondary to best fit with the Guide. - In 1937, Francis Salet reused this technique for the whole of France and stuck on the walls of the Musée des Monuments Français in Paris an immense map of «chemins de Saint-Jacques». - En 1958, Elie Lambert stated that the Guide was incomplete and that many important shrines were not mentioned. And he concluded by saying that "as with Rome all roads lead to Compostela". He relied on this statement when declaring : "there could not be a better proof of the considerable importance of the pilgrimage". He set himself to complete the Guide and published a map next to that of F. Salet. Around 1975, an editor drew a very attractive map inspired by the works of de La Coste-Messelière. He astutely dated it 1648 and put it on sale in the bookshops of all the national museums in France and even in Spain. Its esthetic value ensured that it would also find the favour of buyers. Starting in 1960, René de La Coste-Messelière ensured the promotion of the Pilgrim's Guide by devoting dozens of articles to it. Inspired by the foregoing maps, he designed another, which he completed by placing a kyrielle of hospitals, chaplaincies, etc, all the charitable establishments dedicated to Saint James and even, carried away in his élan, all those which mention having received pilgrims. He was the originator of the placing of a plaque at the foot of the tour Saint-Jacques in Paris, a tower which he defined as «the first waymark fifty-eight metres high, marking the departure point for Compostela». The first yellow arrow waymark, soon followed by millions of others, more numerous than pilgrims. Ignoring the fact that the Guide was unknown in France in the Middle Ages, the media ended up imposing these towns as gathering points at the head of routes represented as historic. 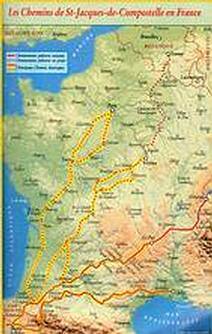 After 1970 the routes were traced and waymarked for walkers, at the instigation of the CNSGR (Comité National des Sentiers de Grande Randonnée, which became the FFRP, Fédération Française de la Randonnée Pédestre) making reference to pilgrim routes such as they	could have been deduced from the Guide. In the absence of precise indications in this and in imitation of what had been done by	René de La Coste-Messelière, everything which carried the name Saint-Jacques or which had some kind of pilgrim symbol (such as a shell) was considered as an indicator of a route to Compostela. The first "Saint-Jacques" traced was that starting from Le Puy-en-Velay. It was followed a dozen years later by that of	Arles. From the 1980s, numerous associations were created with the goal of serving pilgrims by tracing and waymarking routes. This notable activity of associations continued into 2004. In 1984, "taking into account the existence, in several countries, of associations dedicated to making pilgrimage routes better known", the Parliamentary Assembly of the Council of Europe "recognises their historical importance and particularly that of the Santiago de Compostela Pilgrim Route" and "recommended the Council of Ministers draw inspiration from the example of the Santiago de Compostela Pilgrim Route as a reference point for similar action with other pilgrimage routes". This initiative was thus started in an ambiguous fashion. The Assembly was inspired by the pilgrimage but recommended the promotion of routes for which it created a special emblem. The first is symbolic, the second material. The pilgrimage is unique, routes are multiple. The pilgrimage is unifying, routes are a vehicle for political and economic interests. Continuing on from the recommendation of 1984, the solemn declaration of Compostela of 1987 proclaiming the "first European Cultural Route" is a model of the mixing up of genres. « Cultural identity is, today as yesterday, the fruit of the existence of a European space loaded with collective memory and traversed by roads which overcome distance, frontiers and misunderstandings. This represents an inability to define a policy adapted to a complex reality and divergent objectives. The current evolution of the European Institute of Cultural Routes into a technical tourist agency with everything aimed at the profit of the Greater Region centred on Luxembourg demonstrates this. Without the slightest attempt at authenticity, new maps have been produced. They trace back arbitrarily four routes in France into eight or nine European routes. The illusory nature of the maps drawn for Aquitaine by Alexandre Nicolaî and for France by Elie Lambert is even more so for Europe. The Council of Europe recognises the symbolic character of these routes by making them intangible "Cultural Routes" whilst at the same time encouraging publication of guides and maps and actions on the ground of no serious historical validity. Those historians who at the time argued for a serious methodology in the research into routes were not listened to. Whole sections of these routes are now classified as World Heritage Sites, on the grounds that they are historical. This official recognition is a modern manifestation of entirely medieval behaviour, as a myth becomes a reality. In fact, there is no evidence that either the four routes or their extensions ever saw more pilgrim traffic than any others. Of course, Vézelay, Tours, Arles or Le Puy, saw the convergence, on certain dates, of crowds of pilgrims come to honour Mary Magdalene, St Martin, St Trophime or St Cesarius, a marvellous Black Madonna. But history has so far found no evidence of large departures for Compostela from these towns. Looking at the routes, Europe has forgotten the very real pilgrims who actually used them. It has set up a substantial study leading to a database on their use by pilgrims to Santiago of Galicia. It has left its mark in a confused way on any number of roads that have nothing to do with Compostela. There remains the question why this Guide was ever created, for, even if it was never widely distributed, even if it remained in the archives of the cathedral in Compostela, the document does actually exist, and is perfectly authentic. An answer can be found in the Chronicle of Alfonso VII, king of Castilla and Galicia, written soon after his death, at the time of a very contentious succession (his son Sancho III succeeded him in 1157 but died in 1158, leaving the throne to his 3-year-old son Alfonso VIII). This chronicle describes him as «the head of the Empire … Following on from Charles (Charlemagne), he ressembles him. They were equals by race, identical in force of arms». 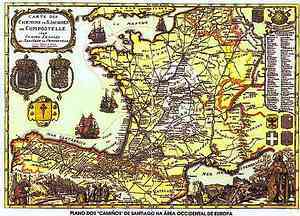 A list is given of the places and noblemen in Aquitaine who had agreed to recognise him as emperor. It recalls how Alfonso invited noblemen originating from «all Gascony and all the regions which extend to the Rhone, as well as Guillaume de Montpellier… and those from Poitou in large numbers» to join him in «extending the frontiers of his kingdom from the shores of the Ocean, that is to say from the rock of Saint James, to the course of the Rhône». So the emperor does not present himself as a conqueror but as a pole of attraction, whilst recalling that Saint James is patron of his empire. Now, the geographical area thus evoked coincides with the map drawn in the Guide, an area of which the frontiers are delimited by the four great shrines of Tours, Vézelay, Le Puy, Arles. Presented as departure points for Compostela, they in fact mark the outer limits of the Spanish influence that the partisans of the young Alfonso VIII were seeking to preserve. The proposed routes are thus nothing but indications, pinpoints of purely theoretical value. Today, the routes have taken on new life, but every pilgrim should know that they too, just like Alfonso VII's vassals, can choose their own. In any case, the authors of the chansons de gestes suggested other routes, The Itinéraires de Bruges, written in Flanders in the XVth century, gave further ones. To these must be added those legendary ones taken by the Apostle when he evangelised the western world and which can be found here and there, such as the “footstep of Saint James” at Buxerolles, near Poitiers. When he became a pilgrim, the Apostle above all made his mark as a guide on the routes of the final great pilgrimage, the one that leads to Heaven, right at the end of the Milky Way, «chemin de Saint-Jacques» which finds there its only real significance. The terrestrial routes of the «pilgrimage of human life» are the image of these celestial routes, outside the waymarked paths. The pilgrims of Saint James who follow them, without necessarily being aware of it, are thus like the shadow of the departed for whom they intercede by their prayers or simply by their presence. Parue en juin 2003 aux Editions Tallandier, la première traduction intégrale en français de tous les livres du Codex Calixtinus. Cette traduction a été faite par Bernard Gicquel, l'un des membres éminents de la Fondation David Parou Saint-Jacques. Faite dans une langue accessible et agréable, elle est précédée d'une analyse critique de l'origine des documents qui constituent le manuscrit conservé à Compostela. Pour 27 €, un livre de près de 800 pages avec de nombreux appendices. Plus de quinze années de travail, une base pour une meilleure compréhension du phénomène compostellan et de nouvelles recherches, une source d'enrichissement pour tous les esprits curieux une invitation à la réflexion pour tous les pèlerins et marcheurs de saint Jacques !